The History of Cornwall is fascinating and sometimes controversial. The evidence of a colourful history is everywhere. There are many websites and other sources that dedicate themselves to it amongst which the Cornwall County Council has a very informative time line. We have researched from various sources, but cannot take any responsibility for the accuracy of it. Essentially the history is as follows…. It has long been accepted that early people came to the UK from Europe and then spread throughout the mainland. Recent scientific finds show that Kent's Caverns caves in Torquay (in neighbouring Devon) has some of the oldest human remains in the UK. The most obvious evidence of ancient history in Cornwall suggests some seaside settlements and hill forts. 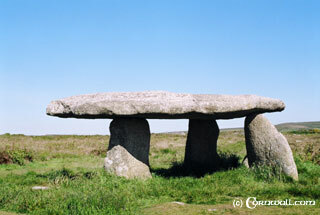 There are some remnants of Neolithic settlements such as the Standing Stones (Menhirs, eg Hurlers, Quoits (eg Lanyon Quoit as in the photo) and other Burial Monuments such as Bollowal Barrow were constructed. Around 2500 BC the Bronze Age began, when people started metalworking for the first time and Cornwall’s obvious assets of Tin and Copper saw some growth in the amount of settlements. The extraction of copper and tin at this time would have been limited to washing it from the mud in the streams. By the Iron Age of 500BC, these first inhabitants were joined by other European settlers now known as the Celts who brought with them new metalworking skills. Some examples of small settlements from this Iron Age period include Chysauster or Carn Euny. By the time the Romans Arrived in Britain the Tribe of the South West of Britain was known as the Dumnonii . The Romans had a presence in the South West with a fort at Exeter and at Nanstallon (near Bodmin) but Roman influence in the area is less noticeable than in other areas of the British mainland. Although the Dumnonii tribe was as far North East as Bristol, later Roman documentation points to the area of what is now Cornwall being known as Cornouia, the land of the Cornovii tribe. With the Romans leaving Britain and the arrival of the Anglo Saxon settlers saw a new period of cultural conflict. As the Saxons settled in the east, the west of the mainland became the base of the Celtic way of life. This was a violent period and after the defeat in the Battle of Deorham Down near Bristol in 577AD, the West Welsh / Dumnonii were split from their Welsh counterparts. The Saxons brought with them new skills, but there were obvious differences with their Celtic counterparts. Firstly, the most obvious is language, as the Celts spoke their Celtic language opposed to the Anglo-Saxon languages that later evolved into English. At this time, the Celts were converting to Christianity in part due to the Irish Saints which many Cornish Towns are named after including the patron Saint, St Piran. Over the next four hundred years the Saxons advanced into the West and although they attacked and at one point came into Cornwall, the Celtic Culture and Language was left completely in tact. This is the period associated with the legends of King Arthur which are often associated with Tintagel and other places in Cornwall, but there are no historical facts to verify this. With the arrival of the Normans to the British mainland in 1066, the River Tamar became the agreed border. There was also a general acceptance that Cornwall had a separate identity to the rest of England. The Normans installed their own Feudal political system of Earls and Cornwall was no exception. Robert of Mortain became the Earl of Cornwall and built Launceston castle. This entity confirmed in Mappa Mundi (the historic map now located in Hereford Cathedral) shows the four constituent parts of Britain as England, Scotland, Wales and Cornwall. The importance of mining can be seen during this period exemplified by the Stannary Charter of 1305 that re-affirmed the Crown's right of pre-emption, its first call upon the tin mined in Cornwall and Devon. This was confirmed politically when in 1338 Edward the Black Prince, (eldest son of Edward III) was created the first Duke of Cornwall. 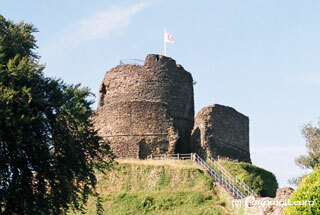 The castles he was associated with include Restormal (pictured) and Launceston castle. Ever since, the eldest son of the King or Queen of England is the Duke of Cornwall with Prince Charles being the current Duke. This creation of a Duchy is seen as significant by today’s Cornish Nationalists who claim it as proof that Cornwall is not part of England. During the Black Plague, towns such as Truro and Bodmin lost half of their populations. The mining in this period had developed since the early period but was still hampered in its scale by the amount of water present underground. In 1497 Henry VII tried to raise taxation to pay for his war against the Scottish, there was considerable unrest which resulted in a rebellion organized by Michael Joseph An Gof a blacksmith and a solicitor Thomas Flamank who marched on London along with Lord Audley with a small poorly armed army only to be met and defeated by a 10,000 strong Professional army at the Battle of Deptford Bridge, Blackheath (just south of Greenwich). The leaders were all caught and executed. This event was commemorated in 1997 with a similar march and there is now a commemorative plaque on Greenwich Park wall as pictured. 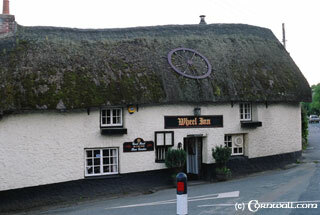 Later in 1507, Perkin Warbeck landed in Cornwall as a Pretender to the throne and received some support from the Cornish, who still felt aggrieved from the previous incidents, although this was a short lived attempt. Buildings from this period include Cotehele and Godolphin . One of the later results of this was that in 1508 Henry VII passed the 'Charter of Pardon' This established the rights of the Stanary Parliament to veto English legislation. This is another significant fact associated with Cornish Nationalism. 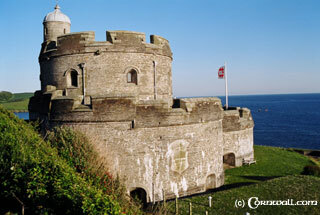 During Henry VIIIs reign, international security became more important and the Cornish Coast was fortified with the castles of Pendennis, St Mawes and at Fowey . There doesn’t to have been any major conficts in Cornwall during the Reformation, although with the resulting introduction of the Book of Common Prayer in English, this was to have a major impact in the later demise of the Cornish language. Things settled down after the Civil war, although in 1688 Bishop Trelawny was imprisoned in the Tower of London for refusing to sign a document supporting the return of Catholicism as the official religion. This event is later made famous by the song, which is the most popular Cornish song, although the 20,000 men marching on London seems to be refer to the AnGof rebellion of 1497). Mining was continually expanding in its volume and complexity and by 1740 there was the deep mining of Copper. This was made possible by the invention of more sophisticated pumping equipment to remove some of the water from underground. The industrial revolution had a huge impact and Cornwall at this time was amongst the most industrialized part of the UK, if not the world. With this change in the foundations of the society brought with it other pressures including social, that when John Wesley first visited the area it was a wild place. 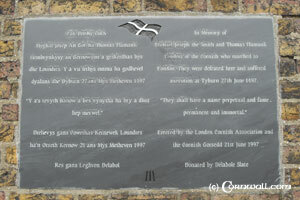 Methodism was to become a popular religion in Cornwall with almost every village having a Chapel. The industrial period also brought in new riches to the area with a number of large stately houses being built by the wealthy mine owners. Mining is a dangerous occupation and one of the worst disasters was in Levant mine in 1919. This emigration was not all one way traffic. A number of men returned to Cornwall with their wealth to buy new homes or farms. This can be seen in some of the names exemplified by houses with exotic names such as Benoni (South Africa), Selangor (Malaysia) Arica (Chile/Peru border) in St Just, a farm called Dakota (USA) near Madron / Morvah or The Mexico Inn at Long Rock near Penzance. The industrialisation also had a knock on effect for the fishing towns that built new harbours to cope with the import and export of copper, tin and machinery. Tin wasn’t the only industrialisation, as China Clay was processed at various sites with St Austell being the main centre. This caused large heaps of white waste that completely transformed the landscape of the surrounding area looking like snow peaks. The port at Charlestown was built for the export of clay and today looks just as it would of in its heyday. 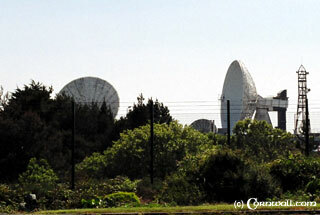 Eden has since been built in one of the former quarries and the other heaps have mostly been removed. Traditional fishing villages can be found throughout Cornwall and some of them seem little changed for hundreds of years, although in some cases, towns have grown around the historic core. 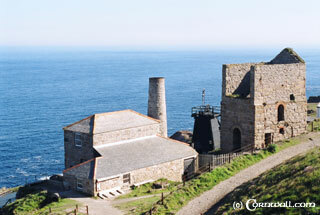 Good examples are Port Isaac, Mevagissey, St Ives or Mousehole . This strategic position has also been important during wartime and Cornwall saw some action, during the WWII when many of the beaches were mined and pill boxes are still visible on a number of beaches. Neighbouring Plymouth saw considerable action, mostly because of Devonport Naval dockyard with most of the City centre being destroyed. Fortunately Cornwall did not suffer that same level of destruction. Since the war, there have been major changes to the economic situation and not only mining, but even the other industries such as china clay, slate, farming and fishing have become under pressure. The last of the mines Geevor and South Crofty closed in 1980s and 1990s respectively,in the face of international competition from low wage economies including countries where Cornish expertise had developed the mining industry. However recent rises in the price of tin could hopefully see some revival at South Crofty. Not everything is bad news. 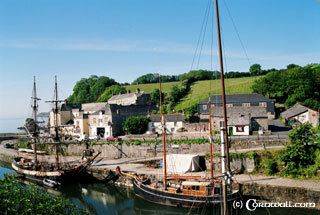 Cornwall has long been popular as a summer destination amongst the upper class as far back as Henry VIII. It developed as a tourist destination during the Victorian era when it became fashionable to go to the seaside and towns such as Newquay changed from being a fishing village into a popular resort. Financially, tourism now accounts for a large part of the Cornwall’s economy, but it does place a lot of price pressure on local houses where the wages are below the national average. Obviously Cornwall faces a lot of competition in tourism, but its beautiful scenery, unique character and charm guarantees a continual interest and loyalty from all who visit it.